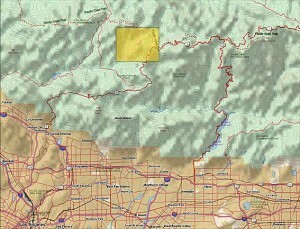 Representatives of the Concerned Off-Road Bicyclists Association (CORBA) have received approval from the the Angeles National Forest Service on a proposal for a new trail in the Chilao/Mt. Hillyer area—already a popular destination for mountain bikers, hikers and rock-climbers. Both the Forest Service and CORBA recognize that this trail helps to meet a growing demand within the community of trail users, especially mountain bikers. The new trail, officially named “Mt. Hillyer Rock & Rail Trail”, will be approximately 1 mile long, running from near the summit of Mt. Hillyer northward to near the junction of the Santa Clara Divide Road 3N17 and the existing Mt. Hillyer Trail 11W27. The new trail will make it easy to do loops of the trail and to “session” trail features. CORBA’s trail designers had their thinking caps on—their new trail proposal included mountain bike specific features such as log rides, bermed turns, boulder gardens, granite slick-rock, teeter-totters, log bridges, drops and jumps. The Mt. Hillyer Rock & Rail Trail is designated as multi-use, and signs will indicate advanced or difficult lines, intermediate options, and alternative bypasses for beginners and other trail users. CORBA will need to raise approximately $82,000 in grants and donations to fund the project. CORBA has committed $6,500 from their general fund, $2,000 has been received in private donations, and a $10,000 grant was pledged by Bikes Belong. The funds will be used to purchase tools, materials, signage, machinery fuel, a kiosk and for other expenses involved in the construction. CORBA hopes to break ground on the trail in fall 2008, and be riding it by the spring of 2009. This entry was posted on Saturday, May 17th, 2008 at 6:18 am and is filed under Advocacy, Trail Access. You can follow any responses to this entry through the RSS 2.0 feed. You can leave a response, or trackback from your own site.